It’s late. You’re hungry. You need sustenance. Where do you turn? Stop at any one of these places in downtown Las Vegas and you won’t be disappointed. You’ve heard stories about this place, and for good reasons. It’s hailed by many as the best Thai food in Vegas. This is the perfect place to be if you’re downtown late at night and craving pad thai, spring rolls, or curry. Or if you have clogged sinuses. Seriously. The food gets spicy. Bring Kleenex. Their home page looks like it’s under construction, so check out some of their glowing Yelp reviews. Okay, so it’s not a “restaurant” per se; but The Beat is certainly more than a coffee shop. They have baguette pizza and hummus and deviled eggs and french toast and alcohol and why are you not there right now??? I’m enjoying my French Press here at @TheBeatLV with the ever cozy background music. And the ambiance. Let’s talk about the ambiance. They have their own zine library–aptly titled the Las Vegas Zine Library–AND vinyls. Stop by and see for yourself. They’re open until midnight Monday-Saturday and until 5pm on Sunday. Du-Par’s is located in the Golden Gate Hotel & Casino and is open 24/7. 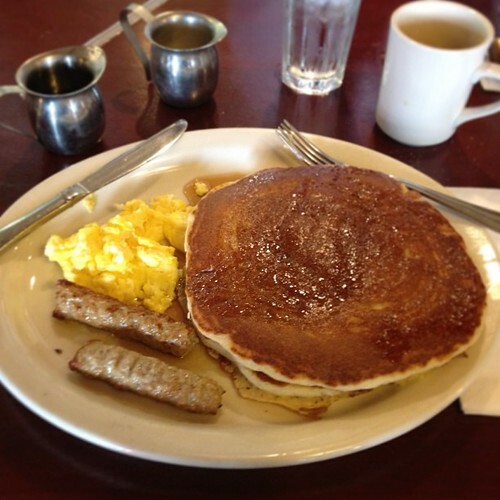 They’ve got the “Best Pancakes in America” (Esquire Magazine), the “Best Pie in Las Vegas” (Las Vegas Weekly Magazine), and they were recently named one of the Top 5 24-Hour Diners in Las Vegas. Lauded by customers as the most genuine and authentic all-American food in Vegas, Du-Par’s made it’s first appearance back in 1938! Fukuburger moves around quite a bit; they’re sort of on wheels. Okay FINE–IT’S A TRUCK. Don’t judge. You will never have anything like Fukuburger. As they say on their site, they do “All-American burgers with a Japanese twist.” And hot dogs. And crispy chicken. You can check the schedule on their page so you’ll know where to find them; it’s even better when you stumble upon them through fortuitous happenstance. @fukuburger Our pleasure! We’re glad to see that fans from all over the world are still flocking to your truck. Kabob Korner is the ONLY halal restaurant in the city. Locals and tourists alike stop here for excellent middle eastern food, friendly customer service, and the warmest, softest, pillowiest (yeah, we said it) pita bread in Sin City. They also deliver and cater. Kabob Korner is open 11am-11:30pm Monday-Thursday, 11am-midnight Friday-Saturday, and 1pm-10:30pm on Sunday. What do they serve? An easier question is what don’t they serve. In addition to award-winning microbrews, they’ve got hand-crafted beers, appetizers, hand-made pizza, gourmet burgers and sandwiches, steaks, ribs, AND a sushi bar. They only close from 7am-11am. We’ve got it all: signature pizzas (including vegan! ); traditional bar food, like wings, fried pickles, and garlic knots; salads; and dessert (even more vegan!). 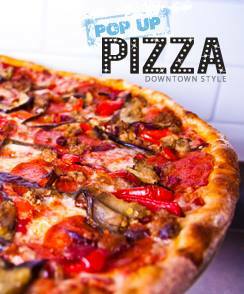 We’re open daily until 2am and after you buy nine slices, you get the tenth one free. Order online, get it delivered to your door, and don’t forget to like our Facebook page for more great deals. Ready for a slice? Visit us today, place your order on our site, or call (702) 366-0049.